There is hardly any reputable school across the globe where corporal punishment is still practiced. It is prohibited in most schools and is considered to be utterly unacceptable. This form of punishment leads to several serious issues. It hurts a child’s self-respect and tarnishes his/her confidence. On the other hand, it may even make him/her more rebellious instead of acting as a rectification. For this reason, schools have turned to less severe forms of punishments, such as writing lines or holding students in detention for an hour after school. Nevertheless, certain teachers may still resort to corporal punishment on occasions when they lose their temper. Some may even start practicing it more frequently disregarding the school’s policies against it. In such circumstances, parents should make a complaint to the school’s principal immediately. It is an extremely serious issue that needs to be dealt with right away. Parents have a right to make a complaint and show their concern when their child suffers physical mistreatment at school at the hands of a teacher or any other member of the school staff. An institute’s principal has to go through various tasks and there is a considerable amount of paperwork to deal with. Therefore, your complaint letter should be effective in order to grab his/her attention and highlight your issue. The following tips should be followed in order to write an effective complaint letter against corporal punishment. Although you have a complaint against an offensive treatment of your child, you must adopt and maintain a courteous tone throughout the letter. Since you are writing to the principal of a school, keep in mind his/her respectable and prestigious position. Therefore, it will be polite to begin by acknowledging the fact that his/her job is challenging with a large load of responsibilities. The head of the institute needs to spare some time to go through your letter and give consideration to your complaint. Beginning the letter in this respectful way exhibit’s the writer’s own caliber. The principal will be more considerate towards your complaint when you approach him/her in a sophisticated manner. State your complaint right in the first paragraph. Mention the issue precisely. Choose words which highlight the seriousness of the matter. A school’s principal has a lot to deal with during the course of the day. Therefore, you should state your issue as clearly as possible right at the beginning. In this way, you will make the purpose of the letter clear. 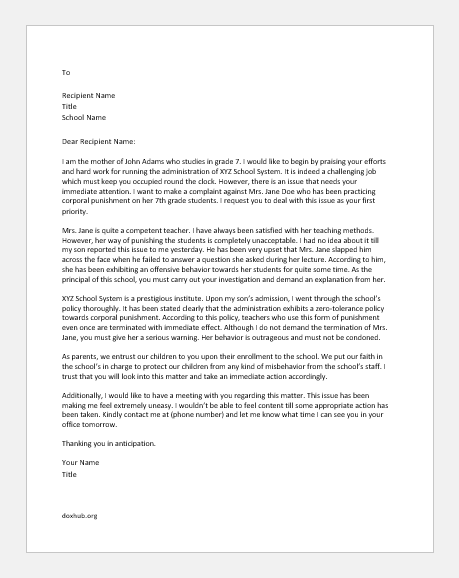 No principal would neglect the rest of the letter after finding out about this significant issue. For that reason, if you want due consideration towards your complaint and a quick response from the letter, state right at the beginning the name of the teacher who practices corporal punishment, what class he/she teaches and the name of the student who suffered at his/her hands. The rest of the details should be explained later as the letter goes on. After stating the complaint it is now time to elaborate the issue. Here, you can mention the incident explaining how and when your child suffered the punishment. In this case, your child is the only source of information you have about the related details. Depending on your child’s age, you have to take into account his/her credibility. Therefore, despite explaining all that your child has told you, you should also ask the principal to carry out his/her own investigations as well. As a parent, you must feel extremely worried when a teacher hurts your child physically. You feel insecure for your child when he is helpless against his instructors at school. Do use this letter to highlight these concerns. The principal should know that you are against corporal punishment and do not approve of it under any circumstances. You may suggest a solution to this problem. Moreover, as a parent, it is your right to even demand a possible solution to ensure the complete protection of your child. For instance, you may ask the principal to suspend a teacher for practicing corporal punishment as a serious action against his/her behavior. Do provide your contact details in the letter. The principal might want to communicate with you regarding the issue. Conversely, you might want to contact the principal for a meeting to discuss further details. Therefore, it is necessary to provide your details so that the principal can call you up to fix a meeting time. I am the mother of John Adams who studies in grade 7. I would like to begin by praising your efforts and hard work for running the administration of XYZ School System. It is indeed a challenging job which must keep you occupied round the clock. However, there is an issue that needs your immediate attention. I want to make a complaint against Mrs. Jane Doe who has been practicing corporal punishment on her 7th grade students. I request you to deal with this issue as your first priority. Mrs. Jane is quite a competent teacher. I have always been satisfied with her teaching methods. However, her way of punishing the students is completely unacceptable. I had no idea about it till my son reported this issue to me yesterday. He has been very upset that Mrs. Jane slapped him across the face when he failed to answer a question she asked during her lecture. According to him, she has been exhibiting an offensive behavior towards her students for quite some time. As the principal of this school, you must carry out your investigation and demand an explanation from her. XYZ School System is a prestigious institute. Upon my son’s admission, I went through the school’s policy thoroughly. It has been stated clearly that the administration exhibits a zero tolerance policy towards corporal punishment. According to this policy, teachers who use this form of punishment even once are terminated with immediate effect. Although I do not demand the termination of Mrs. Jane, you must give her a serious warning. Her behavior is outrageous and must not be condoned. As parents, we entrust our children to you upon their enrollment to the school. We put our faith in the school’s in charge to protect our children from any kind of misbehavior from the school’s staff. I trust that you will look into this matter and take an immediate action accordingly. Additionally, I would like to have a meeting with you regarding this matter. This issue has been making me feel extremely uneasy. I wouldn’t be able to feel content till some appropriate action has been taken. Kindly contact me at (phone number) and let me know what time I can see you in your office tomorrow.